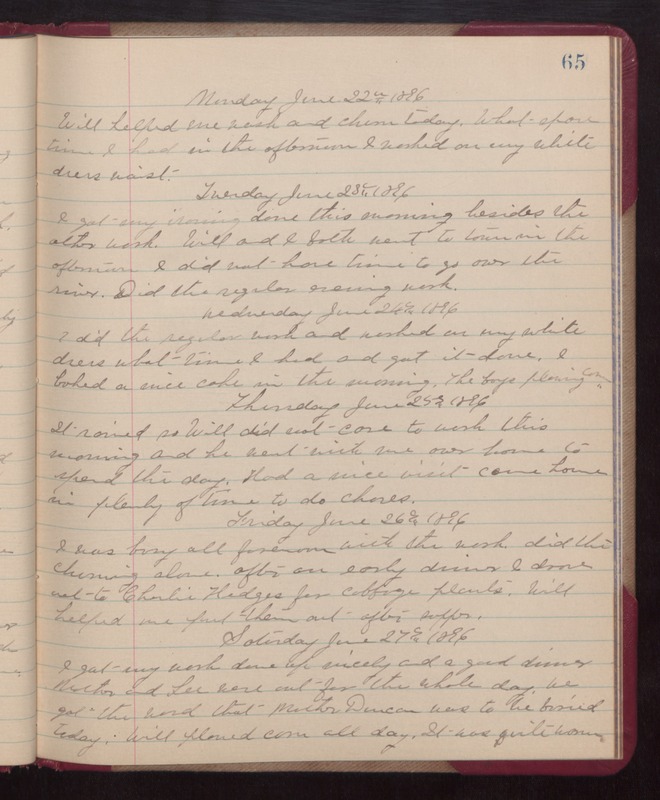 Monday June 22nd 1896 Will helped me wash and churn today. What spare time I had in the afternoon I worked on my white dress waist. Tuesday June 23rd 1896 I got my ironing done this morning besides the other work. Will and I both went to town in the afternoon. I did not have time to go over the river. Did the regular evening work. Wednesday June 24th 1896 I did he regular work and worked on my white dress what time I had and got it done. I baked a nice cake in the morning. The boys plowing corn. Thursday June 25th 1896 It rained so Will did not care to work this morning and he went with me over home to spend the day. Had a nice visit came home in plenty of time to do chores. Friday June 26th 1896 I was busy all forenoon with the work. Did the churning alone. after an early dinner I drove out to Charlie Hedges for cabbage plants. Will helped me put them out after supper. Saturday June 27th 1896 I got my work done up nicely and a good dinner Mother and Lee were out for the whole day. We got the word that Mother Duncan was to be buried today. Will plowed corn all day. It was quite warm.